The Panasonic HDC-SD60 contains a wide shooting range from 35.7mm wide angle to 25x optical zoom. The Crystal Pro Engine immediately processes the huge amount of data that goes into Full HD 1920x1080 images, and produces clear, firm animated images. And it is also compatible with the new generation of high-capacity SDXC* memory cards so you’ll be offered plenty of space to store your HD videos and high resolution images. Having learnt the brief introduction of Panasonic HDC-SD60, you must be interested in how to use it and how to put Panasonic HDC-SD60 MTS files to FCP X for further editing. As 1080 50/60p MTS files have been proved not be able to be imported to FCP X, I shot several videos in 1080 50i resolution ratio to show you detailed steps to import MTS files to FCP X. Usually, I use Aunsoft Final Mate for Mac to merge several MTS files into one to get an easier editing process. At first, I need a USB cable to get connection between Mac and the SD60. Final Mate offers me a choice to decide whether import the files to it or backup MTS files in backstage without any disturbance on my whole process. After that, I press the Ctrl button and click to check the MTS files I want to merge, and directly drag them to the time line. 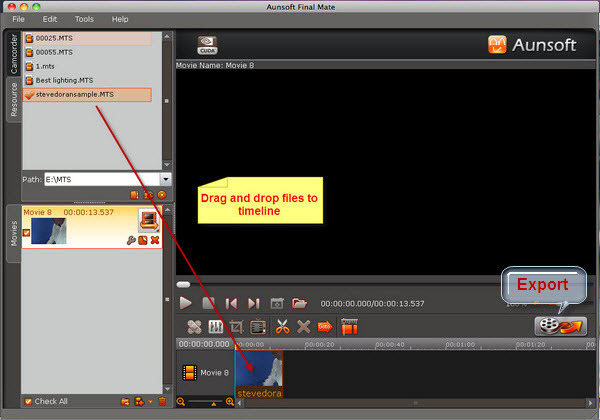 This step is meanly to create a movie for lossless output MTS file. The next, I do not change anything and directly click the Export button and wait for the final file. It does not take much time before the process coming to the end. Then, I run the FCP X and click file button to import MTS file to it. After I drag the file to the timeline in order to have a further editing, a prompt dialog box appears and informs me of rendering the file. After searching for the information about render, I have learnt that render is a process to express video or audio files to computer from their file structure. Eventually, I edit the file with some simple steps, and actually I enjoy the process of recreating videos and I can learn more during the whole operating.